Ku is worshipped under many names, including Ku-ka-ili-moku, the "Seizer of Land" (a feather-god, the guardian of Kamehameha). Rituals included human sacrifice, which was not part of the worship of the other gods. Ku, Kane, and Lono caused light to shine in upon the world. They are uncreated gods who have existed from eternity (Tregear 1891:540). In Hawaiian mythology, Lono is a fertility and music god who descended to Earth on a rainbow to marry Laka. In agricultural and planting traditions, Lono was identified with rain and food plants. He was one of the four gods (with Ku, Kane, and his twin brother Kanaloa) who existed before the world was created. Lono was also the god of peace. In his honor, the great annual festival of the Makahiki was held. During this period (from October through February), all unnecessary work and war was kapu (taboo). This is also the season of taxes, olympic like games and when chiefs regrouped their forces (and organized campaigns ironically). Some Hawaiians believed that Captain James Cook was Lono returned and indeed this fact may have ultimately contributed to Capt. Cook's death (see James Cook - Third voyage (1776-1779)). However, it is uncertain whether Captian Cook was taken for the god Lono or one of several historical or legendary figures who were also referred to as Lono-i-ka-Makahiki. According to Beckwith, there was indeed a tradition that such a human manifestation of the god [Lono] had actually appeared, established games and perhaps the annual taxing, and then departed to "Kahiki," promising to return "by sea on the canoes ‘Auwa’alalua" according to the prose note. "A Spanish man of war" translates the queen, remembering a tradition of arrival of a Spanish galleon beaten out of its course in the early days of exploration of the Pacific; "a very large double canoe" is Mrs. Pukui's more literal rendering, from ‘Au[hau]-wa’a-l[o]a-lua. The blue-sailed jellyfish we call "Portuguese man-of-war" Hawaiians speak of, perhaps half in derision, as ‘Auwa’alalua. The mother honored Keawe's son, perhaps born propitiously during the period of the Makahiki, by giving him the name of Lono-i-ka-Makahiki, seeing perhaps in the child a symbol of the tiki god's promised return.” (Beckwith 1951). Kanaloa is one of the four great gods of Hawaiian mythology, along with Kane, Ku, and Lono. He is the local form of a Polynesian deity generally connected with the sea. 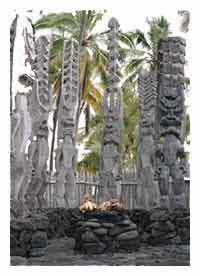 Roughly equivalent deities are known as Tangaroa in New Zealand, Tagaloa in Samoa, and Ta'aroa in Tahiti. In the traditions of Ancient Hawaii, Kanaloa is symbolized by the squid, and is typically associated with Kane in legends and chants where they are portrayed as complementary powers (Beckwith 1970:62-65). For example: Kane was called upon during the building of a canoe, Kanaloa during the sailing of it; Kane governed the northern edge of the ecliptic, Kanaloa the southern; Kanaloa points to hidden springs, and Kane then taps them out. In this way, they represent a divine duality of wild and taming forces like those observed (by Georges Dumezil, et al.) in Indo-European chief god-pairs like Odin-Tyr and Mitra-Varuna, and like the popular yin-yang of Chinese Taoism. Interpretations of Kanaloa as a god of evil opposing the good Kane (a reading that defies their paired invocations and shared devotees in Ancient Hawaii) is likely the result of European missionary efforts to recast the four major divinities of Hawaii in the image of the Christian Trinity plus Satan. Kauhuhu lives in a cave on the side of a high ocean cliff that is protected by two ancient Hawaiian dragons. He arrives to his cave by riding the eighth wave in a set of giant waves. He devoured any man the saw him and his dragons killed anyone who entered his cave. Once however he found a man in his cave and quickly pounced on him and had him halfway in his mouth when he took pity on him. The man, Kamalo, was able to explain quickly enough that his sons had been murdered for playing a powerful chiefs tiki drums. The chief, Kapu, was very powerful and everyone feared him so Kamalo had to seek Kauhuhu, the shark god. The shark god instructed Kamalo to return to his village in the Mapulehu Valley and to prepare a sanctuary with many sacred animals and surrounded by sacred white tapa kapu staffs. Then he would wait the arrival of the shark god. A giant cloud would float against the wind over from the Lanai island. It would grow in size and cover the mountains above Mapulehu Valley. From it a rainbow would appear and Kamalo would know the shark god had arriaved. Kamalo returned to his home and took care of the shark gods old priest (kahuna) who he carried up a cliff, he then placed the kapu staffs in a large ring on the cliff, fencing in the sacred animals. Kamalo called all those close to him together to live within the enclosure. Then he waited with his eyes toward Lanai. Months past until the cloud appeared, it traveled against the wind and came to rest above the mountains that loomed over the Mapulehu Valley. A rainbow appeared and the winds began to pick up force. Towering dark Storm clouds soon blew in and a great storm began to rage. Lightning broke the sky and torrential rains poured forth in quantities the island had never known. The water rushed down the mountains into the valley in a flash flood. The torrent rushed from the mountain with such force everything before it was swept up into it. The only area that was not devastated was the sanctuary with in the kapu staffs where Kamalo and his followers watched in awe. The storm ravaged the land and the waters flooded the valley, washing everything before it away. Kupa, his home, all of his followers and possessions were washed into the sea where the people of Kauhuhu's sharks awaited to deliver Kamalo's final revenge. The bay waters were soon stained red with the blood of Kupa and his followers. After this day the bay was known as Aikanaka, meaning 'man-eater', and everyone learned a great respect for the power of clouds in the peaks above their village. Everyone that heard the story also learned great respect for the power of the Shark God, Kauhuhu. In ancient Hawaii, there was a class of people called Olohe who were hairless and often specialized in wrestling and bone breaking. Unfortunately, they were also known to be cannibals and robbers. Their leader was Kaupe and he had the power to turn into a giant dog. He used these powers to stalk and kill men until his death. Now he hunts hawaiians as a ghost dog. Once a shark king noticed a beautiful princess on a Hawaiian beach. He approached her in the form of a great human chief and they fell in love. They were married and she became pregnant. However, on the night before she gave birth to her son, Nanaue, the Shark King departed. He warned her to never let the boy eat meat and returned to the sea. When the boy was born the princess noticed a slit on his back, she kept it covered and hid it from the village. As he grew this slit became a large shark mouth upon his back that he kept covered from all. When the boy grew to be a man she could not eat with him because of a strict taboo against women and men eating together. One day the boy ate meat and developed a ravenous taste for it. From then on he would follow people to the beach when they went swimming, he would then turn to the form of a giant shark and eat them as they returned to the shore. However, after many died the village became suspicious and tore Nanaue's shirt off revealing the large shark mouth on his back. After much struggle and vicious bites from the mouth on Shark Man's back the villagers tied him up. The high chief then ordered that a great oven be built and everyone dug a pit and placed stones in it. They then attempted to heave the Shark Man into the oven, but he then turned himself into shark form, snapping the ropes that bound him. Nanaue flopped, snapped at people and eventually tumbled down a hill into a river that flowed from the Waipio falls. The warriors of the valley ran along the side of the river, throwing spears and stones at the giant shark, but none dared enter and before they could get their nets Nanaue swam into the sea. Nanaue swam far from Waipio valley and was not sighted again until he resurfaced in Maui were they had not yet heard about the Shark Man. He resided near Hana and married their chief, a beautiful women. There, he secretly fed on the people of Maui until he became careless and was seen changing shape and attacking a victim. The villagers then launched canoes and hunted Nanaue out of their waters. Nanaue later surfaced in Maui where he settled near Hana. Unfortunately though, he hadn't lost his taste for human flesh and he began feeding on innocent villagers. One day he became careless though and was spotted changing into shark form to pursue a swimmer. The warriors of Maui then lunched their canoes and pursued him instead! Using spears and nets they attempted to capture and kill the Shark Man, but he slipped away into the wide ocean. Once again the Shark Man remerged onto a Hawaiian island. This time it was Molokai where he began a new life. Swimmers began disappearing again though and suspicion was raised. The network of Hawaiian Kahunas had by this time spread the word about the dangerous Shark Man and kahunas of Molokai placed everyone on alert. The fishermen, who were a crucial part of the effort to find the Shark Man, noticed a man slip into the water and then a giant shark in the sea. They cautiously angled their boats toward him then threw out their nets. The Shark Man was entangled, but he would soon escape; however the warriors of Molokai were ready and launched their canoe and joined the struggle. The great shark form of Nanaue was stabbed with spears and repeatedly netted. Kahunas chanted and used all of their magic to sap the shark of his great strength. The terrible struggle stained the sea red but the might of the Molokai fishermen, warriors and kahunas proved to be too much for Nanaue. He was eventually dragged to the shore where he was beaten with war clubs, slashed with sharktoothed weapons and stabbed with spears. Finally the form of the great shark reverted back to that of a man with a shark mouth on his back, bleeding from dozens of wounds in the shallow red stained surf. In Hawaiian mythology, Lua-o-Milu is the land of the dead, ruled by Milu. Dead souls enter Lua-o-Milu through a trail called Mahiki. The spirits of the dead can watch what the living do and turn them to stone by staring at them. In a famous creation story, the demigod Maui fished the islands of Hawaii from the sea after a little mistake he made on a fishing trip. From Haleakala, Maui ensnared the sun in another story, forcing him to slow down so there was equal periods of darkness and light each day. Pele is another famous deity, the fiery (in more then one way) daughter of Kane who brought the sea to Hawaii and causes lava flows. Hawaiian lava sledding (Hawaiian: he‘e holua, "mountain surfing") is a traditional sport of Native Hawaiians. Similar to wave surfing, he‘e holua involves the use of a narrow 12 foot long, 6 inch wide wooden sled (papaholua) made from native wood like Kau‘ila or Ohia. The sled is used standing up, lying down, or kneeling, to ride down man-made courses of lava rock, often reaching speeds of 50 mph or greater. In the past, Hawaiian lava sledding was considered both a sport and a religious ritual for honoring the gods.